As you are reading this I am off to Portland (Oregon-USA) where I will be doing my last semester. I am so exited! I will try to post as often as I can, but it wont be an easy job ;). The pictures are taken while buying a new suitcase in the outlet village Parndorf, you should visit it if you ever come to Vienna. 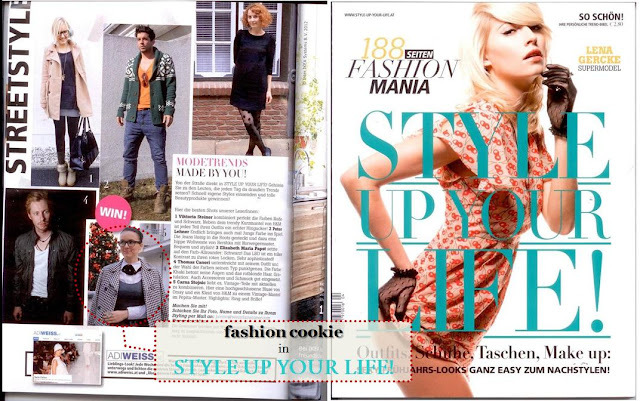 As you can see I was also published in one of Austria's magazines and I am so happy! Now back to packing :)! Wish me luck! Odlična kombinacija. Plava suknja i ta bluza. Baš si preslatka. hvala draga :),tek se navikavam, a i shoppping mi pomaze ;). Pa sta da ti kazem za Parndorf, jeste se popravio malo, mogla bi svratiti ;D.
So cute look!! Lovely skirt! Great bag, whole combo is like dream! Especially skirt! wollte immer diesen gürtel haben! super look süße. Sretno sa semestrom u Portlandu! Taj kajs mi se tolkikooo svidjaaa i voljela bih znati gdje da ga nabavim!! Suknjica je fenomenalna! Mene nije bilo neka 4 mjeseca (nisam imala fotica, ali sada sam tu!) :)) Imam novi psot finally, pa navrati! The idea of the gif is so nice!If you want we can follow also with bloglovin, google+, twitter and facebook? so cute, i love the print of your top! a ovaj Moschino kais svaku cini savrsenom! mnogo mi se dopada kombinacija <3 za moschino! Oh my gawd love your belt, its fabulous! Dying for your Moschino Belt!! Thanks for the follow, I'm following back!! Great outfit! This belt is super cool!